Stretching the One Income Dollar: It's Official- The Wedding Date is October 28th And We're Going Cruising!! It's Official- The Wedding Date is October 28th And We're Going Cruising!! I just completed our booking today with a Calvin, over at Cruise Adventure Travel .He has been such a big help with all my questions and getting us a great rate, as well as making sure we have that good old insurance protection. 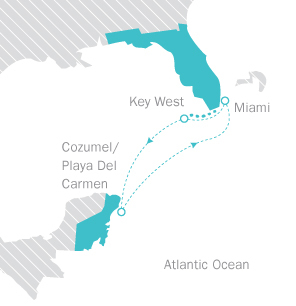 Booked a Carnival 4 Day Western Caribbean cruise with balcony.We will be leaving out of Miami on the 27th, with stops in Key West,( where we will be getting married on the beach), and over to Cozumel,Mexico. Our wedding date will be the 28th of October, and Gerry's birthday is the following day.So needless to say, there are travel plans to be made and wedding plans to be made.And we didn't want to take too long of a cruise as we have never did this before and not sure if we will like it or how wobbly we will feel out there on the ocean. If anyone has taken this cruise, I would love to hear from you. We have a long journey as we will be leaving from our home to the city, ( 6 hours away to catch our flight), then a 6 hour flight at the least I believe. Lots of travelling but I'm sure it will be well worth it. In Key West, we have found a great place that will be also helping us with our wedding once we dock there for part of the day.They will be a big part of having alot ready for us, but will still need to look for a dress,etc..